Neoliberalism remains a flashpoint for political contestation around the world. For decades now, neoliberalism has been in the process of becoming a globally ascendant default logic that prioritizes using economic rationality for all major decisions, in all sectors of society, at the collective level of state policymaking as well as the personal level of individual choice-making. Donald Trump's recent presidential victory has been interpreted both as a repudiation and as a validation of neoliberalism’s hegemony. What it will take politically to get beyond neoliberalism. 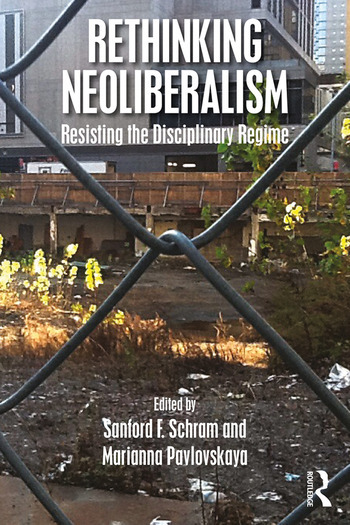 Written in a clear and accessible style, Rethinking Neoliberalism is a sophisticated synthesis of theory and practice, making it a compelling read for students of Political Science, Public Policy, Sociology, Geography, Urban Planning, Social Work and related fields, at both the advanced undergraduate and graduate levels. Sanford F. Schram teaches at Hunter College, CUNY where he is Professor of Political Science and Faculty Associate at the Roosevelt House Public Policy Institute. He also teaches at the CUNY Graduate Center. His published books include Words of Welfare: The Poverty of Social Science and the Social Science of Poverty (1995) and Disciplining the Poor: Neoliberal Paternalism and the Persistent Power of Race (2011)—co-authored with Joe Soss and Richard Fording. Both books won the Michael Harrington Award from the American Political Science Association. His latest book is The Return to Ordinary Capitalism: Neoliberalism, Precarity, Occupy (Oxford University Press, 2015). Schram is the 2012 recipient of the Charles McCoy Career Achievement Award from the Caucus for a New Political Science. Marianna Pavlovskaya is Professor of Geography at Hunter College and CUNY Graduate Center. She has a MA in geography from Moscow State University and a PhD in geography from Clark University. Her major fields include urban geography, feminist geography, and critical GIS (Geographic Information Science). Her current research examines neoliberalism and the production of economic difference in post-Soviet Russia, the role of the census, statistics, and geo-spatial data in constitution of the social body, the relationship between gender, class, and work-related migration, and the emergence of the solidarity economy in the United States. Her work appeared in the Annals of the American Association of Geographers, Geoforum, Europe-Asia Studies, Environment and Planning A, Cartographica, Urban Geography, and many edited volumes. She worked on international research projects with colleagues from Norway, Uganda, and Russia.